Not again. 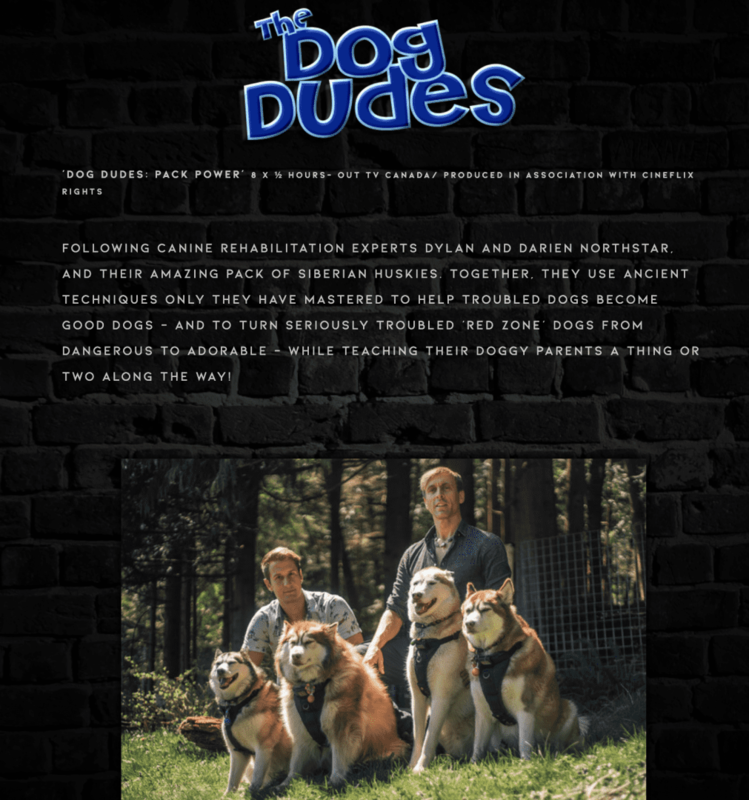 The Dog Dudes, as these two guys call themselves, are apparently set to appear on TV in Canada, via Mayhem Productions. Ancient indeed – and actually antiquated is a far better word for it. The Dudes are sadly mistaken when they say you won’t see their methods elsewhere. For one, can you say “Cesar Millan?” Sadly, you will see these antiquated methods done by others. The entire basis of their theory is simply wrong. Though dogs evolved from wolves (a wolf species long extinct) dogs evolved with people. And people, over time, selected for affiliative behaviors we see today in dogs. I can cite lots of science detailing why and how aversive ad punitive training methods do more harm than good, creating potentially physical damage but absolutely psychological damage. Training dogs using techniques some trainers defend by saying “wolves do it” just isn’t true. For example, wolves don’t admonish others by rolling them over on their backs. 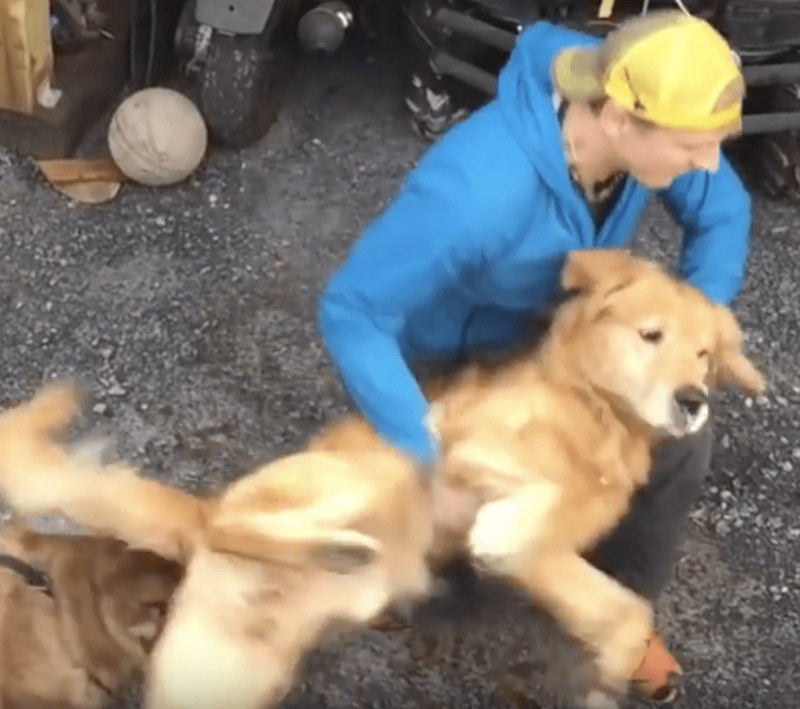 But that is exactly what the Dog Dudes decide this Golden Retriever, named Max, who is clearly mistrusting of strange dogs, needs. 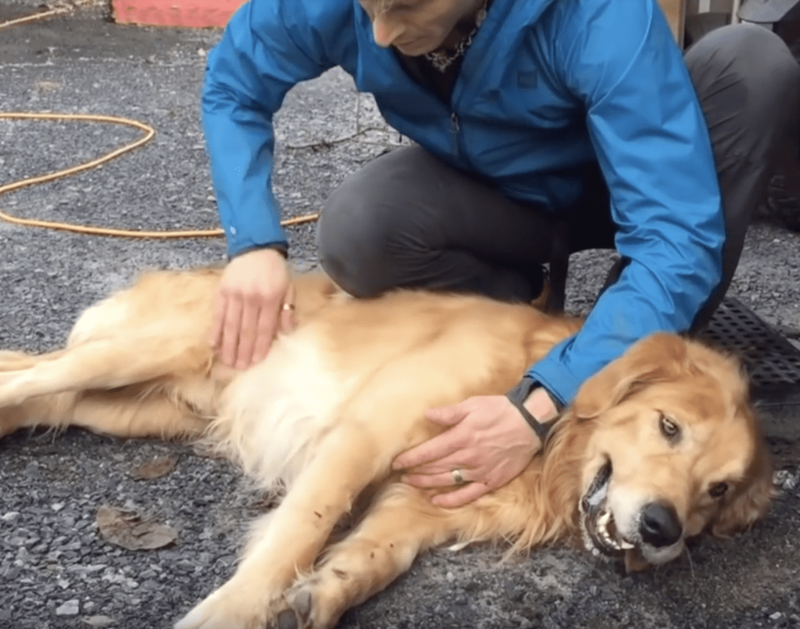 to roll the Max over, sometimes referred to as an “alpha roll.” This does teach the helpless Golden that people can be strong – but nothing else. And finally, you tell me how this dog looks (below). The answer is physically and mentally exhausted – completely spent. 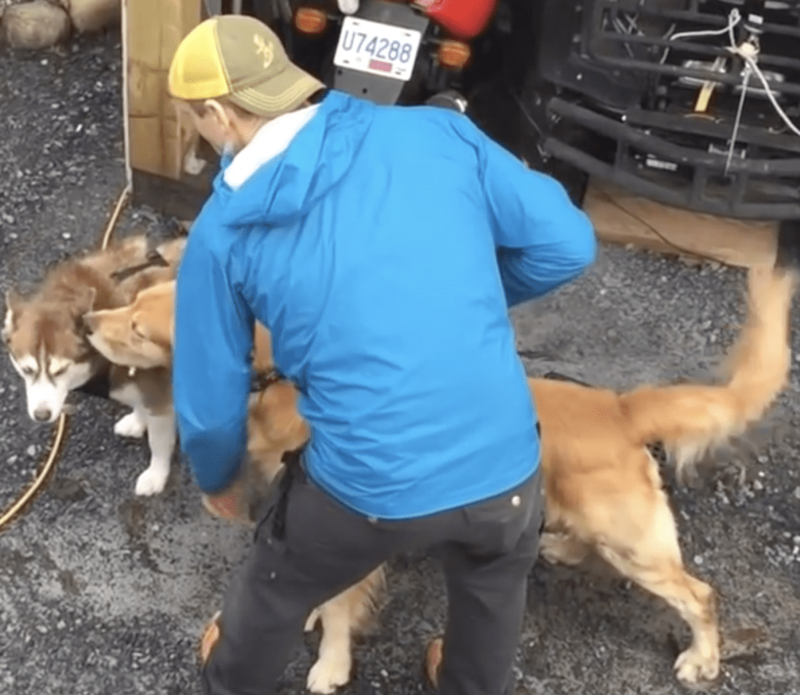 So, what did Max learn in this lesson about getting along with other dogs? According to the Dog Dudes, this technique “grounds energy,” whatever the heck that means. It’s true that Max, does walk somewhat contentedly with the Huskies and even bounds into the ocean having a good time. Just as there were slices of truth in what Cesar Millan said, the same here in what the Dog Dudes say and how they use their pack. But when Max’s owner says that he can now confidently take Max off-leash because he feels he will be great with other dogs, I’m terrified of what those result might be tomorrow, or next week or next month. This form of training is something that educated trainers today would never replicate. 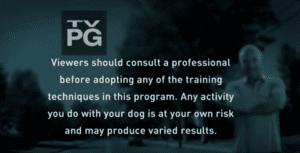 I’d like to believe that television programs featuring dog trainers are supposed to feature what is best for dogs and other family members. However, I’ve been in TV myself long enough to know better. It’s really about having a gimmick. And the producers feel the Dog Dudes have one. 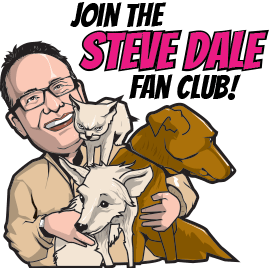 If this show makes it to air, I can see families watching at home exposing their own “pack” to the aggressive dog down the street, just as the Dudes expose their own dogs. The Dudes are professional trainers; people who watch trainers on TV are not. Also, at least some of the techniques, like the antiquated alpha roll, we actually know for a fact is not beneficial and may be a welfare issue. Even if the producers are wiling to do this to dogs, are they willing to deal with the appropriate wrath of humane groups as well as educated trainers? When the Dog Whisperer went on the air in 2004, audiences weren’t as sophisticated as they are today. And frankly as nice as I am sure the Dudes are, they don’t seem to have Cesar Millan’s on-camera charisma. 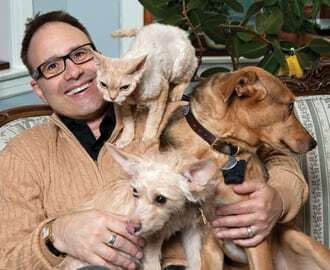 When I first saw “The Dog Whisperer,” my stomach turned. One of the first actions I saw on a show was Millan turning a dog upside down (like the Dog Dudes did above). Rolling over the dog to show he was dominant was about what he said by way of explanation, and also he spoke about energy. Then being on the Board of Directors of the American Humane Association, we did persuade the National Geographic Channel to place warnings on the screen to not try those techniques at home, and pointing out the show is only for entertainment purposes. However, the warnings did little good, and Millan’s ratings continued to climb. The more they climbed, the more Nat Geo took offense to concerns I offered in print and on air about Millan’s aversive methods. In 2006, after even dog lover Oprah Winfrey celebrated Millan, I called Millan “The Dog Screamer.” My explanation is that from a dog’s perspective, he was hardly whispering. Others, like the late Dr. Sophia Yin, eventually chimed in. The response was as aggressive as the training methods, as Nat Geo even once threatened to sue me. Having real credentials never seemed to matter. Some readers maintained I and others were jealous or prejudiced or just ignorant about how dogs really tick. By now, I’d like to believe that most people (though I realize hardly everyone) understand that the notion of training a dog like a wolf makes no sense. We’ve been living side by side with dogs and working with them for thousands of years. We rarely share our beds with wolves. Also, I agree with any trainer who suggests that being a teacher and providing consistent structure is absolutely very important. But that’s a far cry from saying we are the Alpha pack leader and showing our dogs who is dominant is most important. Best that I can tell, the Dog Dudes partially believe that and also that their that own pack can put “red zone dogs” in their place. Even IF their pack can, I’m unsure how this helps others. Below are the available videos, so if you like you can watch and judge for yourself. Ultimately, I met Mr. Millan several times. I don’t know the Dog Dudes at all, and only know what I have read and seen in these and other videos. This isn’t personal, just supporting what science supports is right for dogs, and also safest for people. If you agree, I hope you also contact Mayhem Productions. Perhaps, the dangerous messages can be stopped before they start.